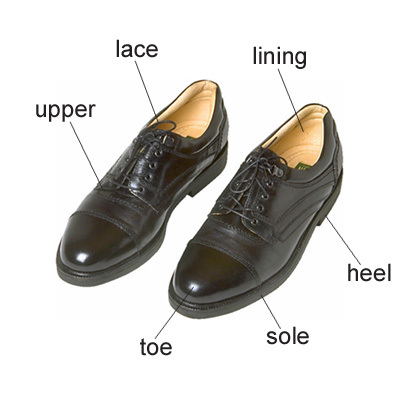 ldoce_300_hshoeshoe1 /ʃuː/ ●●● S1 W3 noun [countable] 1 DCCsomething that you wear to cover your feet, made of leather or some other strong material I sat down and took off my shoes and socks. What size shoe do you take? → boot1(1), sandal, slipper2 → in somebody’s shoes3 → step into/fill somebody’s shoes4 DSHa curved piece of iron that is nailed onto a horse’s foot SYN horseshoe → if the shoe fits, (wear it) at fit1(8)COLLOCATIONSverbswear shoesHe was wearing smart black shoes.put your shoes onPut your shoes on and get your coat.take your shoes offThey took off their shoes in the hallway.tie your shoesHe tied his shoes in a double knot.slip your shoes on/off (=put them on or take them off quickly or gently)She slipped off her shoes and curled her feet up under her on the sofa.kick your shoes off (=take them off by moving your legs)Maria kicked off her shoes and sat down.clean/polish your shoesWe used to clean our shoes every evening before we went to bed.ADJECTIVES/NOUN + shoeblack/brown etcHer shoes and handbag were brown.high-heeled shoesYou can’t walk round town all day in high-heeled shoes!sensible shoes (=flat shoes that are not very fashionable)They were the kind of sensible shoes my mother used to make me wear.flat shoes (=with no high heel)Flat shoes are much more comfortable for walking in.platform shoes (=with a thick base)I found an old pair of platform shoes from the 1970s.lace-up shoes (=fastened with laces)He bought a pair of brown leather lace-up shoes.leather/suede shoesa pair of dark leather shoesrunning/jogging/training etc shoesGet yourself a good pair of running shoes if you want to take up running.phrasesa pair of shoesI need a new pair of shoes.shoe + NOUNa shoe shop British English, a shoe store American Englishshoe polishshoe lacesCOMMON ERRORS ► Don’t say ‘put off your shoes’. Say take off your shoes. shoe• I can't walk in high-heeled shoes.• Repairing the midsole, often the nerve centre of the modern shoe, can be more difficult.• I kicked off my shoes and changed clothes.• Billy needs a new pair of shoes for school.• And then they say - I want a new pair of shoes, Buck sweetie.• To leave the ever-present tension of Great Meadow was like shedding stiff, formal clothes or kicking off pinching shoes.• Williams made his return wearing his infamous red shoes that had specially fitted insoles for his arch.• The choreography is fairly basic but lively, with bits of tap, soft shoe, swing and rock.• Whether for dress or athletics, the fit of the shoe can also make or break a pair of feet.